Real estate experts offer up conspiracy theories about brokers’ home advertising. Soon homebuyers will be searching on portals based on the qualities they personally most desire instead of bedroom counts, which leaves most brokers in the dust. Here’s one broker’s answer to the new algorithms: beating the portals to the punch. 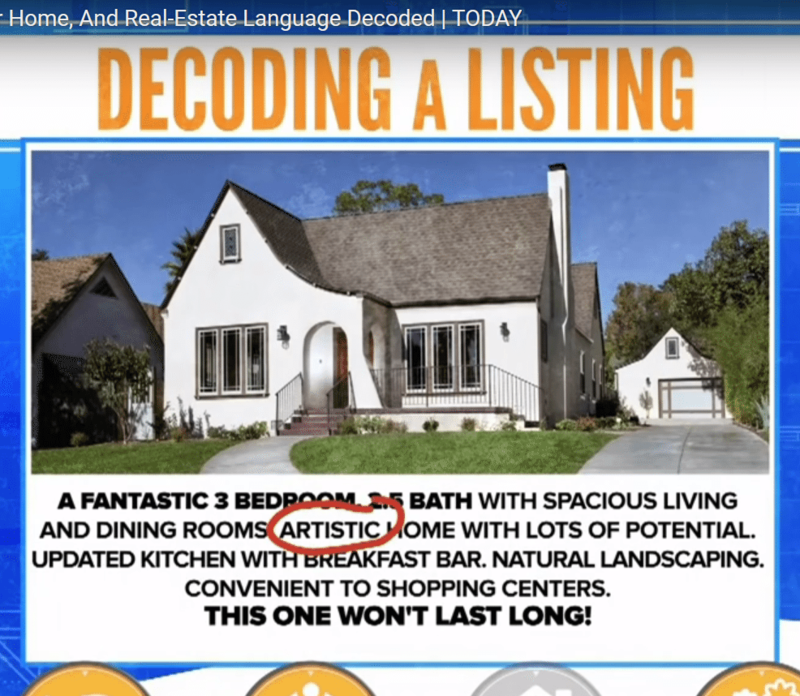 The ““Property Brothers”” postulate that when somebody says it’s an “artistic home,” it’s freak’n weird, and “natural landscaping” means no landscaping. Their new book might go deeper on their thoughts, but we will not. These guys are not the first to suggest that brokers have secret code used to communicate with each other via property descriptions. In chapter two of his 2005 book “Freakonomics,” Steven Levitt specifically states five terms that correlate to higher home prices (granite, state-of-the-art, Corian, maple, gourmet) and five terms (with a punctuation mark thrown in) that correlate to lower prices (fantastic, spacious, “!,” charming, great neighborhood). 5 terms that equal higher home prices: granite, state-of-the-art, Corian, maple, gourmet. He alludes that brokers often use the higher price correlated terms when selling their own homes; and when representing other home sellers using terms such as “fantastic” or “charming,” they appear to be agent code for a house that doesn’t have many attributes worth describing. The power of words chosen to describe each home has vast implications for the marketing of and the value of a home, well beyond what the Property Brothers and most agents understand. We’ll drop the limelight grabbing stars of television and books here. And let’s discuss very seriously text descriptions of homes and how they truly affect buyer demand and the home’s value. A home is worth what a willing and able buyer pays for it based on his or her desire for a home over all other interested buyers. Aside from lending restrictions or economic conditions or supply and demand, this sets a home’s value. Your text description of a home goes global within minutes of writing it. The words you use to describe each home have a profound impact on how potential buyers on the other side of a computer screen feel about that home. Your text description of a home goes global within minutes of writing it. Based on your description and pictures, buyers will have a positive attitude toward that home or a negative attitude toward it. So Levitt’s and the Property Brother’s observations are partially — but very superficially — correct. The potential buyers for a $5 million home might have the desire of being known for living in a neighborhood with a particular name — thus signifying status; this is the location aspect of our three components and is vital to your marketing description and pictures. They have some range of physical requisites for the home: 7,000-plus square feet, six bedrooms, seven baths, etc. This criterion is how most search engines make buyers search now: thus a simple but necessary aspect of marketing. However, your text description and pictorial presentation makes or breaks the buyers’ desire to see the home or not. Particular key phrases and their associated pictures trigger a buyer to visualize future life experiences. The more this happens, the more they like and value the home. Home search using sophisticated algorithms and these kind of key terms will soon replace the bedroom and bathroom counts industry standard search; your marketing description will become even more vital. Levitt’s “fantastic, spacious, “!”, charming, great neighborhood” and Property Brother’s “artistic” and “natural landscaping” are fluff. They have no true concrete meaning that 10 strangers would agree on. They also trigger no future life events in buyers’ minds. They are useless for marketing purposes. So in agreement with Levitt, higher quality finishes do usually correlate to higher prices homes. You’ve now earned your Ph.D. in economics; diplomas are free — you just pay shipping and handling. Ensure that your description and pictures portray as many of the key qualities buyers most seek. Use fluff terms only when it helps your key descriptions flow. Do not try to impose your view of the buyers’ envisioned life events — just offer the terms triggering them to do so. You don’t know if the winding stairs are a vision of a daughter’s prom night or if the wife fantasizes of pushing her husband down them for a $1 million life insurance claim. Do not try to impose your view of the buyers’ envisioned life events. Soon homebuyers will be searching based on the qualities they personally most desire instead of bedroom counts. Have your descriptions and pictures ready now. Demonstrating this vital skill might well differentiate you from your competition and win you some listings. As a broker trying very hard to get ahead of the portals at improving home search, What I have done in my market. Perhaps this will inspire you also to take on the giants of the industry in your own way.